B Satheesan, N Kathiresan, R Aravind. Retrocrural sarcoma - Resection by transabdominal “caudate lobe mobilization - kidney lifting” method. The Internet Journal of Surgery. 2007 Volume 14 Number 2. Retrocrural tumors are rare. The most common tumor in this region is metastatic lymphadenopathy. The retrocrural region is a rare location for retroperitoneal soft tissue sarcoma. Resection of retrocrural sarcoma is a difficult surgical procedure in view of the anatomic peculiarities. For the right-sided retrocrural sarcomas mobilization of caudate lobe and lifting of right kidney will enable the resection. The retrocrural area (behind the crus of the diaphragm) is a very rare location for retroperitoneal sarcoma (1). The common swellings in this location are lymph nodal metastases, soft tissue tumors and lymphoma. 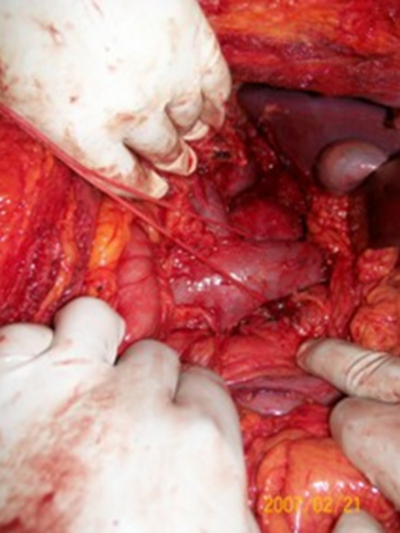 Because of its peculiar anatomical location, the surgical resection is difficult. In this article, we describe the surgical approach to a case of retrocrural sarcoma. In English literature similar reports of resections of retrocrural sarcomas are scarce. A 63-year-old gentleman presented with abdominal pain and vomiting of 3 months duration to our center.On clinical examination, there was no palpable mass in the abdomen. 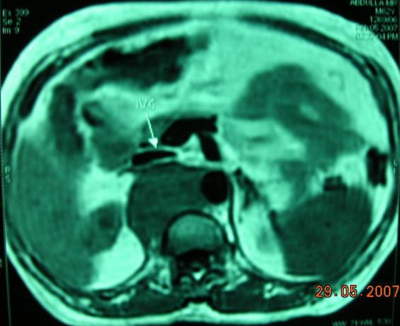 Computed tomography (CT scan) of the abdomen revealed a 7x7.5 cm mass in the retrocrural region (behind the right crus of the diaphragm) at the level of vertebra T12 -L1 and a contrast enhancing mass of 4x4 cm in size in the tail of the pancreas (Figure 1). The tumor had lifted up the inferior vena cava and the same was stretched over the swelling. The tumor was located in the interaortocaval region beneath the crus with adherence to the aorta. The lower limit of the swelling was at the level of the upper border of the right renal vein. The upper border was at the level of the upper border of vertebra T12. There was another contrast enhancing mass of 4x4.5 cm in the tail of the pancreas. Magnetic resonance imaging (MRI) study confirmed the findings (Fig. 2). Staging work-up including CT scan of the chest and bone scan was within normal limits. CT-guided trucut biopsy from the mass revealed pleomorphic sarcoma (high grade). Immunohistochemical studies excluded the possibility of rhabdomyosarcoma. He underwent exploratory laparotomy through right chevron incision. Trucut biopsy of the tumor in the tail of the pancreas was done and the frozen section study revealed neuroendocrine carcinoma. Extended Kocherisation was done up to the SMA. Right and left renal veins were identified and looped separately. Right colon and hepatic flexure were mobilized completely to expose the right kidney and inferior vena cava in the suprarenal level. The anterior surface of the IVC was cleared and the caudate lobe veins draining into the anterior surface of the IVC were ligated. The caudate lobe of the liver was retracted cranially. The IVC was dissected off from the tumor and looped. The SMA was identified and delineated. Right adrenalectomy was performed for exposure of the paravertebral component of the tumor (Figure 3). The lower border of the tumor in the paravertebral region could not be made out. Hence the right kidney was mobilized completely and retracted inferomedially and anteriorly (“kidney lifting”). This enabled to visualize the paravertebral part of the mass completely. The mass was found densely adherent to the vertebra. The crus was divided at the origin from the upper lumbar vertebrae and the lateral parts of the body of the vertebrae L1 and L2 were exposed. The tumor was dissected on its inferior aspect by sharp dissection taking the anterior longitudinal ligaments for posterior clearance. The posterior dissection was carried out to the posterior surface of aorta. The tumor was dissected off from the aorta by incising the adventitia of the aorta in the midline and with adventitia as the clearance the tumor was separated from the aorta. The crus was divided superiorly and the right renal artery was dissected off from the mass. The tumor was thus resected completely though it was only a marginal resection. The rent in the diaphragm was closed. Figure 3: The retrocrural tumor covered by the right crus is situated posterior to the inferior vena cava. Right adrenalectomy has been done to expose the covered tumor. The tail of pancreas tumor was resected by distal pancreatico-splenectomy. The patient had an uneventful recovery. He is disease-free at 4 months after the operation. He was advised adjuvant radiation therapy to the bed of the sarcoma and chemotherapy which he declined. Postoperative histopathology revealed a 7x7.5x4 cm tumor suggestive of leiomyosarcoma on immunohistochemical studies with focal invasion of the capsule by the tumor. High-grade leiomyosarcoma of the retrocrural region with neuroendocrine carcinoma of the tail of the pancreas was the final pathological diagnosis. The retrocrural region is a triangular area behind the crus of the diaphragm extending from the level of the central tendon to the origin of both crura to the upper two to three lumbar vertebrae. The space is anterior to the vertebral bodies and intervertebral discs with associated ligaments. The abdominal aorta emerges from the retrocrural space under the median arcuate ligament and gives off the celiac axis and the superior mesenteric artery at the levels of the twelfth thoracic vertebra and the first lumbar vertebra, respectively. Apart from the aorta, the azygos and hemiazygos veins, fatty tissue, lymph nodes and lymphatic tissue and the sympathetic chains are also located there. The thoracic duct and cysterna chyli are also located in the right retrocrural space. The most common tumors in this difficult location are retrocrural lymphadenopathy (germ cell tumors of testis, lymphoma and other metastatic lymphadenopathy), soft tissue tumors including soft tissue sarcoma and benign tumors like neurofibroma, ganglioneuroma and extensions from the retroperitoneum or posterior mediastinum. There is a report of cystic lymphangioma in the retrocrural space managed conservatively (2). Though a few radiological reports of soft tissue sarcomas have been reported in English literature, we failed to get any literature on resection of retrocrural sarcoma (1). The approaches to retrocrural tumors especially for the resection of post-chemotherapy residues in non-seminomatous germ cell tumors are available. The approaches described are thoracoabdominal and transabdominal by mobilization of liver, splenopancreas complex and mobilization of kidney (3,4). The lesser sac approach by lifting the stomach is also described. In our patient, we used a right chevron incision and a transabdominal approach. Right adrenalectomy and lifting of the right kidney were done to reach the posterior limit of the paravertebral portion of the tumor. Only after adrenalectomy visualization of the paravertebral part of the tumor could be successful. The tilting of table by 15 degrees to the left also helped along with kidney lifting to reach the posterior limit. As the crus forms the anterior clearance of the tumor, the inferior vena cava could be dissected off from the mass easily. Mobilization of the caudate lobe helped to reach the upper limit of resection, which helped to resect most of the right crus.